When Dealing With A Perishable Product Like Milk, It Becomes Vital To Collect It In A Way That Preserves The Life Of The Milk Without Losing Out On The Nutritional Value Of The Product. It Becomes Imperative To Ensure That The Materials Used To Contain The Milk Are Made In A Way That Won’t Contaminate It As Well As Preserve Nutritional Value.,We Have Made Stainless Steel Milk Cans From Food Grade Stainless Steel Which Has A Higher Strength: Weight Ratio Than Any Other Normally Used Material. It Has Great Tensile Strength, Yield Point, Ductility And Hardness. A Large Part Of The Manufacturing Process Also Went Towards Ensuring Longer Operational Durability With A Lower Maintenance Cost. The Surface Was Designed With A 150 Grit Sanitary Finish Giving Each Of The Milk Cans A Polished Surface For Easy And Hygienic Cleaning. The Stainless Steel Milk Can Used Also Keeps The Milk Cooler For A Longer Time. 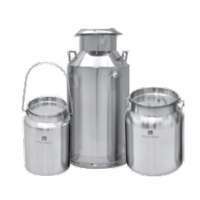 The Stainless Steel Used Has Lower Thermal Conductivity For Containing Milk Between Or During Dairy Processes.